Self-described genius, aspiring cartoonist, and sixth-grade detention record holder Big Nate navigates the trials and tribulations of life in the halls of P.S. 38 with his classmates Gina, Artur, Francis, Jenny and Teddy. 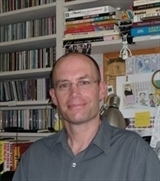 Lincoln Peirce is a cartoonist-writer and the creator of the comic strip Big Nate, which appears in 200 U.S. newspapers. He lives with his family in Portland, Maine.